I have been very fortunate through my career to have been able to eat out at many high end restaurants with numerous accolades. Over the more recent years however, I have noticed a change in approach to the modern day, fine dining eatery. More and more restaurants are removing the starched, white pristine table cloths and instead opting for bare wooden tables. Noma, Faviken and Alinea are fine examples of the bare table parade. The décor is understated with exposed lighting and exposed cement. A very welcome, relaxed front of house is also something I have noticed in this new way of social eating and the waiting staff are much less invasive then they may have been back in the day. A memorable example of invasiveness comes to mind from when I turned 30. I had frequented a very reputable restaurant for lunch as a table for six. With the prices of the said tasting course menu in excess of £150, we were restricting ourselves to one bottle of champagne however the sommelier must have tried four or five times to make us spend more and to me and my guests, it felt like he was looking down on us. I think he may have even muttered French expletives when one of my guests, who will remain nameless, asked for a pint of lager. In a 3 Michelin star restaurant, I have the feeling that the sommelier thought that this was something one should not do! The meal will go down as one of my favourite meals of all time; however the memory of the stiffness, in particular the sommeliers behaviour, will also stay long in my memory. The importance of service in any restaurant should never be underestimated. On a more positive experience, I had the opportunity to eat in a restaurant called Dabbous, which has had a Michelin star status for about a year now and a newly released cookbook. The cookbook is a beautifully made example of great photography which translates into the style of restaurant that I believe will become an even greater trend. The staff are very friendly and dressed informally with exposed cement, exposed lighting and again, bare wooden tables of very high standard without any fuss as the décor. The bread was seeded sour dough brought to us in brown paper bags with the restaurant logo and the date stamped across the front of the bag – there is just something very cool about the understatement. 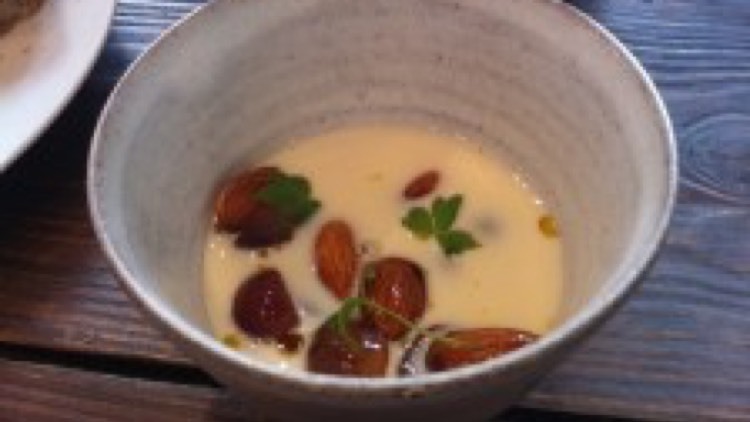 The first course was chilled almond milk with Muscat grapes and lovage – very reminiscent of a muesli breakfast. This was followed by a coddled egg – again another breakfast like course. My two favourite courses were; smoked haddock and watercress served with small diced potatoes, a watercress brothand topped with pickled shallots, which was balanced perfectly. This was then followed by a BBQ pigeon dish in which the flavour and the cooking were superb. This was accompanied by an apple miso, (which I am yet to discover what it is, or more importantly, how it was made) salt baked celeriac, toasted hazelnuts and dandelion leaves. The claw and leg of the pigeon in particular had bags of flavour. Unfortunately for me, that particular recipe is not found in the cookbook. Pair this with a relaxed, friendly service and you are on to a winner. I can safely say that for me and my fellow dining companions, we left there immensely happy.